There isn’t too much to say about this song because it’s all there in the lyrics. It’s about gratitude, impermanence, and self-love. Everything passes – all our relationships to anything in the world, to people, things, situations. And all we can do is learn from it and say thank u, next. Except, one relationship doesn’t pass and that’s to myself. I can find a good relationship to myself. I can treat myself as I would want to be treated by someone important in my life. I can treat myself – and anything coming up in me, all my experiences – with love, kindness, respect, as a good friend or lover. It’s an important pointer. In some ways, it’s the secret to life. And it’s beautiful to see it in pop culture, and especially when aimed at younger women as I assume this one is. Although the pointer is equally valid and essential independent of our gender or age. This song is completely aligned with the insights we find through The Work. I won’t be surprised if this will be a regular song at future Schools. All that can be lost, will be lost. I like how Jeff Foster makes impermanence immediate and personal here. On the surface, this may seem discouraging. All that can be lost will be. And yet, there is a question that may come up for us. If what can be lost will be, is there something that can’t be lost? This is a pointer to what we are: that which all experience happens within and as. That which cannot be lost because it’s not (only) content of experience and because it’s what reality is and what we are. So we will lose anything within content of experience whether it’s a phase of life, health, friends, family, loved ones, pets, jobs, status, roles, identities, states, and so on. Some will be lost within this life, and all will be lost when we die. Some of these losses will seem like a relief to us, some will be mostly neutral, and some will appear as a tragedy – depending on what stories we have about it, how much is invested in these stories, and how much we have examined the stories. And all of it is a very human experience. All of it is part of being human. And yet, it all happens as what we are. If we don’t notice it, the losses may hit us hard. And to the extent we do notice it, there is a space holding it all which takes a bit of the edge off it. Our reaction to the loss may not change that much because it’s created by conditioning and unexamined beliefs in us, but it happens in a different context and that makes a good deal of difference. We may notice this context in immediacy, or – sometimes – it’s just a memory or a knowing. In either case, the new context changes how it’s perceived. It makes it easier to be present with it, allow it, notice it. To hold it more lightly. To relate to it with patience, kindness, and perhaps even appreciation. We are always in transition. If you can just relax with that, you’ll have no problem. I like the when or if way of talking about these things. If I can do this, then this other thing tends to happen. How can I relax with transitions? I can rest with what comes up in me when I am in a transition, as I always am. I can examine my fears. I can identify what it says about me, and examine that identity. I can look at compulsions for it to be a certain way, or be different from how it is. I can meet the fear it brings up in me with gentleness, rest, and kindness. We often stake a claim. It can be on a person, a job, a place, a house, money, our own body, health, insights, skills, or anything else. When we do this, it’s often to create a sense of safety and predictability. And yet, it all goes. We know that. It’s the nature of anything created to change and be uncreated. Whatever it is, it’s ultimately not in our control. To the extent we stake a claim, we suffer when it goes away. And to the extent we recognize it as a temporary gift, we appreciate the adventure of experiences – including of people, things, situations, states – that come and go. Any content of consciousness is impermanent. It comes and goes. There may be the appearance of resistance to it, or struggle, or escape. And that too is free to come and go. That too is allowed. Towards the end of a Living Inquiry session this morning, I have the image of becoming water in a creek. I flow as a creek. Nothing is fixed. It brings up fear and disorientation in me, and I notice how my mind tries to make something me and fixed. My fear is that I won’t know who I am if I can’t find the me that’s fixed. My mind wants to hold onto words and images of myself as fixed. In reality, we are like water in a creek. Life is water in a creek. Nothing is fixed. We learn, at some point, to try to pretend we are something fixed. And then, some of us try to see through this learning. Sogyal Rinpoche: If everything dies and changes, then what is really true? The fear that impermanence awakens in us, that nothing is real and nothing lasts, is, we come to discover, our greatest friend because it drives us to ask: If everything dies and changes, then what is really true? Is there something behind the appearances? Is there something in fact we can depend on, that does survive what we call death? Allowing these questions to occupy us urgently, we slowly find ourselves making a profound shift in the way we view everything. We come to uncover in ourselves “something” that we begin to realize lies behind all the changes and deaths of the world. As this happens, we catch glowing glimpses of the vast implications behind the truth of impermanence. We come to uncover a depth of peace, joy, and confidence in ourselves that fills us with wonder, and gradually breeds in us a certainty that there is in us “something” that nothing destroys, that nothing alters, and that cannot die. And that “something” is not really a thing. It’s what all experiences happens within and as. And that too is just a thought, an idea, an image. The old order changeth yielding place to new And God fulfills himself in many ways Lest one good custom should corrupt the world. A friend of mine from the Zen center is in prison and is given a death sentence. I and others of his friends read through the documents but don’t understand it all at first glance. When I woke up following this dream, I took the opportunity to be with the experiences that came up, including a slight sense of dread. Allowing the experience gave a sense of softness around it and a sense of sweetness mixed in with the initial emotions. It then opened up and the experience shifted into a sense of a nurturing fullness, mixed in with some sadness and a sense of being sobered up. After a few minutes, I explored how this is true for me. How am I already in a prison? In what way am I given a death sentence? I came across this quote earlier today at a exhibit of Binh Danh‘s beautiful photos. A photography is always about the past, something that is already gone. It is a reminder of the ephemeral nature of any situation, experience and life. This situation, experience and life will be gone too, and so will eventually all of humanity. In the same way, I find that thoughts are always about the past. They are either obviously about the past, apparently about the present – yet really about something that is already gone, or apparently about the future – but always projections based on the past. All thoughts are memento mori as well. I can explore this through stories, reflect on how ephemeral my experiences and life is, find a new sense of urgency and appreciation that way, and a help in reorganizing my priorities in life. And I can explore the ephemeral nature of everything in immediacy, as it happens here now. I can expore it through the sense fields, one field at a time. When I bring attention to the sounds, what do I find? Do any sound hang around? If a sound seems to last for a while, does it really? Can I notice how stories about past, current and possible future sounds create a sense of continuity? Can I find continuity outside of those stories? Can I notice how a story tells me a sound is similar to or the same as a previous sound? Is it really the same? I keep coming back to death practice. For instance, I can visualize my own death – in as much detail and as vividly as possible, and take time for it to sink in and notice what happens. What if I knew for certain that I would die in one year? One month? One week? One day? One hour? One minute? One second? What happens? What would I like to use that time for? What is important? What happens to my identifications with this body and this human self? I can visualize my body as already dead. With the flesh rotting and falling off the bones. The skeleton itself disintegrating. I also sometimes go to graveyards and visualize the disintegrating bodies underground, and my own body as if already there disintegrating. And I can remember people and animals in my life who are now dead. I will be dead like them before I know it. My days are numbered, even if I don’t know the number. Everybody I know will be dead in just a few decades. All of humanity will eventually be dead and gone. These types of practices can have many effects. The obvious gift of impermanence is that it keeps everything new, fresh and different. (When filtered through an overlay of stories of time.) Life and experience never repeats itself. Even when a story tells me something is the same as something else, it is fresh and different. Even the same story is always fresh and new as it happens here now. In terms of evolution, impermanence is also very helpful, so helpful it is essential. It allows for this universe and life to evolve. We wouldn’t be here if it wasn’t for impermanence and everything that happened before us. And in terms of human evolution it is that which allows for new and fresh perspectives for each generation. Impermanence is also an invitation to grow and wake up. It helps us notice when we attach to a story as true, making it into a should that inevitably clashes with (our stories) of what is. And in this friction is an invitation to examine those beliefs and identifications. Are they true? Can I know they are true? Are they helpful? What happens when I hold onto them? (And they clash with what is, was or may be.) Who would I be without these beliefs? What are the grain of truth in their reversals? Living a lie is painful, this pain is an invitation to find what is more true for us, and when this is lived, there is clarity and kindness. And even simpler, impermanence is what allows all content of experience to come and go, living its own life, on its own schedule. Am I that which comes and goes? Something does not come and go. What is that? What is it that does not come and go? In a conventional way – and at the thought level – it is pretty obvious that none of us own anything. We don’t own this body. We don’t own these thoughts. We don’t own these emotions. We don’t own these insights. We don’t own delusion or awakening. We don’t own any thing. It all comes and goes as guests. Yet, there is a lot more to explore here. For instance, what is this “I” that something appears to belong to? When I explore it for myself, I find a sense of an “I” here – created by images and sensations. There is an image of myself as a human being owning (or not) something. And there is an image of a doer associated with certain sensations in the head/neck area. And also, I find that what I am is that which all of this happens within and as. That is the “I” without an “other”, so not really any “I” at all. Also, how does it feel to stay with this realization. What happens when the body “gets” it? As always, this inquiry is for myself and for my own sake. And whatever I find can easily coexist with the conventional ways of looking at ownership – although they tend to come up as needed, for a specific situation, and held lightly. I keep noticing how the flavor of experience is always fresh. And it is fresh because it is awakeness itself. I noticed this when I just looked through a series of photos from last winter. Many are very similar to each other, but even small changes in cropping makes a big difference in experience. I quite literally experience myself and the world differently. (Which I do whenever anything in any field changes, even slightly.) And it is also fresh since it is awareness itself. The photo is from the woods down the street from where I grew up. I spent a lot of time there with friends, family and on my own. It is good to fully allow whatever comes up when we lose something important to us, whether a person, situation, dream or something else. I can allow and be with the experience of it, with compassion and kindness for myself. I can inquire into some stories or beliefs I have around it. I can explore impermanence through stories (everything/one I know will be gone), and also immediately through the sense fields. But it is also interesting to explore it in a different way. Is it really lost? When I explore this for myself, I recognize elements of what was lost in others, nature, music and myself. The characteristics and dynamics of it pops up if I look for it. If I am receptive, I may find it everywhere, including right here in myself. In that sense, it is not really lost. This happens within form, and at the level of my human self – as who I am. I can also notice what I am – that which experience happens within and as. And here, I see what that person or situation or dream really was in everything. So situations, people and dreams do go away, in a certain sense, and it is good to acknowledge that and our response to it. That situation or person is gone forever, and there is a stark finality to it. At the same time, is it really lost? Within content of experience, I find elements of that which was lost everywhere – if I am receptive to it – including right here in myself. And when I notice what I am, I see what that person or situation really was in everything. As usual, this is something that is less than helpful if it becomes a belief. (It can be just another way to deny our human experience.) But it can be quite helpful if we explore it for ourselves. In terms of growing up (healing/maturing as who I am, this human self in the world), facing death invites in a motivation to grow up. I have limited time here, and want to make the most of it. Similarly, facing death helps me clarify my priorities. I am invited to clarify what is most important for me, and align my life with that. Facing death at this level happens mostly within the dynamics of stories. I realize that everyone and everything I love and know, incluing myself, will die. I see it. Feel into it. Find genuine appreciation for it. (After all, death at all levels of the holarchy of the universe is what makes life possible. We are made up of stars that died a few billion years ago. We wouldn’t be here if it wasn’t for the whole process of life and death that went before us, at the levels of stars, species and individuals. Also, life is dynamic, dynamic=flux, flux=death.) Make it alive for myself. Allow it to work on me and reorganize me as who I am. In terms of waking up (noticing what I am), facing death may invite in a motivation to wake up. This human self is around for only a limited time, and I want to make use of this opportunity to invite what I am to wake up to itself. Equally important, I can explore death – or rather, impermanence – here and now, through the sense fields. I can notice how anything happening within each sense field is flux, guests living their own life, coming and going on their own schedule. There are no stable anchors within content of awareness that I can place an “I” on. But still, there is a sense of what I really am not coming and going. What is it that is not coming and going? Working with death is like working with anything else. I can visualize my own death sometime in the future and see what comes up. What if I knew I would die in one year, a half year, one month, one week, one day, one hour, one minute, one second? If I make it as vivid and real as possible for myself, what comes up? I can notice beliefs and stories coming up an take them to inquire later on. I can fully allow and be with emotions, as they are, in a wholehearted and heartfelt way. I can allow myself to reorganize within this new context of knowing that my death is imminent. How would I live my life differently? What becomes more important? Less important? How can I bring that into my life here and now? I can do the same with the death of those close to me. I can bring up the memories of people in my life who have died. I can visualize those alive dying in the future. I can do the same with human civilization, the earth and this universe. I can visualize it all being gone, which it will be – first when my human self dies, and then when it dies. In all of these cases – visualizing my own death, the death of those close to me, and the death of everything I know and appreciate – I can work with what comes up in the same way. I can notice beliefs coming up and take them to inquiry. I can fully allow and be with emotions in a heartfelt and kind way. I can allow my human self to reorganize within this new context, seeing how priorities and motivations change, and see how I can bring it into daily life. Daily life offers other opportunities to work with this, such as when death is a theme in the news and movies. These are all ways of working with death and impermanence within stories. But there are also ways of working with impermanence outside of stories. The simplest I have found is to explore impermanence within the sense fields. I bring attention to the sense fields, one at a time, and notice the impermanence there. Each sense fields is flux. The appearance of permanence is only a mental field overlay of a story of permanence, whether it is an image or discursive thought, or a mental field memory/mimicking of sense fields such as touch or taste. 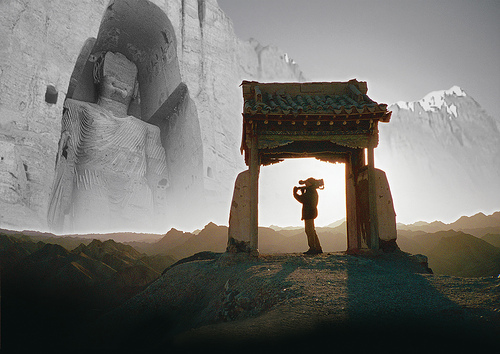 I watched The Giant Buddhas earlier today, a documentary about the Bamyan Buddhas shown as part of our local/international archaeological film festival. It is a very well made movie, weaving together several different stories and perspectives: A Chinese monk traveling along the Silk Road around year 630. A woman from Kabul visiting the Buddhas that her father has visited in his youth. A family living in a cave between the Buddhas, and then relocated by the current regime. A French archaeologist searching for the location of a 300 meter long reclining stone Buddha in the same valley. An Al-Jazeera reporter who filmed the destruction in 2001. When I first heard about the destruction in March of 2001, I thought of how well it illustrates the essential teaching of Buddhism – impermanence. If we really get impermanence, if we see it and feel it, over and over, not only in stories of impermanence but as it happens here now in immediate awareness, there is no foothold for identification within content of awareness. And this invites a shift into Big Mind, into finding ourselves as that which experience happens within, to and as. Exploring impermanence, thoroughly, over and over, as it happens in the sense fields here now, is one of the many ways to discover what we really are, and probably a sufficient one as well. Also, it is an invitation for me – and us all – to see what stories we cling to as true, and examine them and find that is already more true for us. It is a reminder that iconoclasm is maybe not so useful when targeted at artifacts, but has more value and meaning if we target the real icon worship: Taking stories as true. Making a thought – a story, an image – into a God for ourself. And a reminder that we all are at different places in regards to all of this. Some of us take a modern western view on it, emphasizing the value of culture, art and tolerance. Others take a more fundamentalist view, seeing literal iconoclasm as a pretty good idea. And others again see it as a reminder of impermanence, and of iconoclasm having its value if targeted with some wisdom and applied with gentleness. And if we want to be practical about it, we see the validity in each of those views, work on ourselves with impermanence and investigation of beliefs, and in the world in trying to prevent these things from happening using whatever – hopefully skillful – means seem appropriate. Btw: Here is a link to the German version of the movie, although it is also available in English. Attachment to anything – situations, people, things, roles – is what causes suffering. Our stories about what should be and what is clash. Which is fine. It is just part of the human condition. But after a while, and if we act from kindness towards ourselves, we may want to explore this further. What is really going on? Is there another way? One of the first things we may notice is that any attachment is really an attachment to a story. The story of I with an Other, and then all the other stories that flesh out the identity of this separate I.
I am an object in the world, so want what supports this object and do not want what does not support it. I am alive, so don’t want to be dead. I believe in fairness, so want to see fairness in how I and others are treated. We may also notice that an attachment to a story is really an identification with this story. We have a story of an I with an Other, and take ourselves to be this separate I. We have a story of being a particular gender, age, of a particular ethnicity, having certain values, and take ourselves to be all of that. Another thing we may notice is that it is all completely innocent. We are all dealing with this life as best as we can, and often from lack of clarity. And then, that behind all of it is fear. Fear for what may happen to this human self. We attach to stories to deal with this fear, and try to avoid what we are afraid may happen to it. And that behind this fear is love. A love for this human self and whatever is within its circle of concern. All attachments to stories come from love. From wanting the best for what we take as I and us. So how do we explore attachments, or identifications with stories? A simple and direct way is to investigate the beliefs themselves, and find what is already more true for us. I can use a sense of discomfort as a guide to discover when my stories of what is and should be clash, and then investigate one or both of these. Is it true? What happens when I believe that thought? Who would I be without it? What is the truth in its turnarounds? Another is to investigate impermanence in the five sense fields, to see impermanence directly here and now. This helps us reorganize and find stories more aligned with this impermanence. And it also helps us see that no story is absolutely true, which invites a release of identification with these stories. We can also include each of the three centers: head, heart and belly. We can find ourselves as that which is already free from identification with stories, for instance through the headless experiments, the Big Mind process, and finding ourselves as what does not change in the midst of the constantly changing content of awareness. We can invite our heart to open through various heart centered practices, or just a focus on the heart and its qualities. And we can invite in a deep body sense of trust and nurturing fullness through various body and hara centered practices, such as Breema. Each of these tends to invite in an opening in the two other centers, especially if we bring attention to it. An open heart invites in an open mind and a nurturing fullness. An open mind invites in an open heart and a felt-sense of trust. A body feeling of trust and nurturing fullness invites in an open heart and mind. We may also discover that resisting experience tends to close each of the centers. That this happens only when there is an identification with this resistance. And that fully allowing experience, independent of what it is, tends to invite in a receptivity and opening of each center. And that this is also an allowing of the resistance, which is a release of identification with it and the content of experience in general. Buddhism often talk about attachments to things in the world, and how this creates suffering. But is that really what is going on? What is it an attachment really to? And what is an attachment? When I explore this for myself, I find that what appears as an attachment to things in the world is something a little different. Any attachment is to a story only. And this attachment is really an identification with a story. The core story is that of an I with and Other, which is then fleshed out with other stories. And I am identified with these, I take myself as these stories. I am this I with an Other, I am a living being, an object in the world, has a certain gender, age, from a specific ethnic background, has certain interests, skills, values, and so on. I believe I am this human self, so am naturally attached to its well-being and aliveness. (Nothing wrong with that, although the added drama around it may be uncomfortable.) I believe people shouldn’t lie, so am attached to people speaking the truth. I believe a certain type of food will give me comfort, and that I need comfort, so appear attached to that food. I believe an intimate relationship will give me nurturing I cannot find any other way, and that I need that nurturing, so I am attached to having intimate relationships. Our stories about what is and what should be often do not align, so attachments to stories create a sense of drama and discomfort. This is of course fine. But eventually, there may be an impulse to take a closer look at what is going on, and explore working with attachments. One way of working with attachments is to explore impermanence. And we can investigate stories directly. We find a should which clashes with our stories of what is, and take it to inquiry. Is it true? What happens when I believe it? Who would I be without it? Can I find the truth in its turnarounds? This invites identification to be released out of the story. A third way of releasing identification out of stories is to notice what we already are. We can use the sense fields to explore impermanence, see how all content of awareness comes and goes. But something does not come and go. What we really are does not seem to come and go. What is it? What is it that does not come and go? Or we can use the headless experiments to find ourselves as a no-thing full of whatever happens, or the Big Mind process to find ourselves as Big Mind. There are of course lots of ways to explore attachments. These are just the ones I happen to be most familiar with right now. Attachments to situations or things in the world creates drama and suffering, because everything is living its own life and is in flux. We get what we don’t want. We don’t get what we want. We don’t lose what we have but don’t want. We can’t hold onto what we want to keep. This attachment is really an attachment to stories about what is and should be. And this attachment to stories is really an identification with them. We can work with this in two ways. First, by realigning the stories we use, whether we are identified with them or not, with everything living its own life, on its own schedule, and being in flux. Then, by inviting identification to release out of these stories altogether. Realignment without disidentification only works up to a point since the world always will show up differently from our stories about it. There will be a certain amount of drama and discomfort left. Disidentification without realignment will release the drama out of it, but the stories our human self uses in its daily life will not be as closely aligned with the world as they can be. Both are important. And there are several tools for working with attachments in these ways. One is The Work which directly addresses the beliefs, broadens the scope of stores we have available to us through the turnarounds, and invites in a release of identification with the stories. Another is exploring impermanence through the sense fields, which invites in a release of identification with stories, and some realignment of these stories. And we can also find ourselves as that which is already free from identification with stories, through headless experiments, the Big Mind process, or finding ourselves as that which does not come and go in the midst of all content of awareness coming and going. While in Norway, I watched a story on people adopting dogs for the two first years of their life. After that, they are trained and work as guide dogs for the blind. According to the people organizing the adoptions, it is less difficult than most think for those adopting the dogs to let them go, because they know they will only have them for two years, and also have had two years to prepare mentally for the separation. A basic practice in most spiritual traditions is just this: to prepare mentally for the death of oneself and those close to us, to reorganize our worldview in general to align with the impermanence of everything in the world of form, and also see impermanence directly here and now outside of any thoughts. And this in turn is a part of the basic orientation of any genuine spiritual practice: to align our conscious view with reality, and see, feel and love reality as it is. A simple way of reorganizing within the reality of death is to imagine the death of ourself or someone close to us in five years time, one year, six months, one month, a week, a day, an hour, a minute. If I know for certain I will die in a week, what happens? How do I reorganize within that perspective? What becomes more important? Less important? How will I like to live my life? Can I be with the experiences that come up when I imagine that I will die in a week? And there are also plenty of reminders in daily life to explore this…. The death of friends or relatives. Reports of deaths in the media. Stories on possible flu pandemics wiping out large portions of the world population, which we know will come at some point. Our days are numbered for each of us, but we don’t know the number. We may think we know the number, through astrology, premonitions or a medical diagnosis, but that too is just a story. The reality of it is that I and anyone else can die any moment, and that I don’t know when it will be. If I investigate the beliefs that comes up for me around this, what happens? If I fully allow whatever experiences comes up in me around this, what happens? The second basic practice is to see impermanence directly here and now, outside of the realm of thought. To pay attention to sights, sounds, sensations, tastes, smells, thoughts… seeing how they come and go, living their own life, on their own schedule. The world of form as flux. Everything arising as new, different, fresh. Even a thought with the same content as a previous one, completely and utterly fresh, new, different, itself only. All of this may lead to another basic practice: If the world of form is in flux, then who or what am I? When I look, what I am don’t seem to come and go, yet everything within the world of form comes and goes… What am I then? Investigating impermanence in all of these ways… including inquiry into our beliefs around it, being with whatever experiences comes up in us around it, seeing impermanence directly here and now, and exploring what I am if the whole world of form is flux yet what I am does not seem to come and go… is in many ways the royal path to healing and wholeness as who we are, at our human level, and to noticing what we already and always are. Byron Katie says that things come to pass, not to stay. Another way of understanding it is that things come in order to leave. Their reason for happening is to leave, so that we can see our attachments, our beliefs around it saying they should stay longer. Expanding it a little, we can say that impermanence is an invitation for us to see each of our beliefs from many different angles. We get to see our beliefs that something should not happen even as it is. That things should go away even as they stay. That things should come even as they don’t. That things should stay even as they go away. Impermanence is an invitation to notice and investigate those beliefs, revealing that which does not come and go, this awakeness that the world of form happens within, to and as. As long as we take ourselves to be a portion of the content of awareness, there will be a sense of precariousness. Partly because of a sense of a separate I, which is then vulnerable to the whims of the larger world. And partly because there is identification with something inherently transient. There is a belief in a story, which creates a sense of I and Other. And this sense of a separate I is anchored on particular perceptions, such as sensations. Both of these steps are precarious. They need to be maintained, bolstered, protected, supported, actively fueled. And all of this takes a good deal of energy and attention, even if we are not consciously aware of it happening. First the obvious one: Our human self, with its personality and quirks, dies. It is gone forever. At most, some of its influences on others and society continues for a while, but then that is gone too. And another one, which takes a bit of looking: What we are, this awakeness that all form unfolds within, to and as, is free from form, space & time. It is that which form, time and space unfolds within and as. It is always and already here, whether it notices itself or not (temporarily taking itself to be a portion of its own content). This one is not “personal”, it does not seem dependent on this human self. It is existence itself, temporarily functionally connected to a particular human self. As Big Mind, that which goes beyond and embraces all polarities, it continues on independent of any individual self. Or rather, it continues to allow form to unfold within and as itself. Finally, maybe the least obvious one: Our soul self. This alive presence. This one that is not quite personal and not quite impersonal. Not quite in time and not quite outside of time. Not quite located in space, and not quite outside of space. This too is content of awareness, so it is possible to either identify with it and make it into an “I”, or see and appreciate it as just content, similar to the human self. If something continues on an “individual” level, and if there is a vehicle for – for instance – rebirth, it seems that this could be it. We can explore impermanence in two ways, at least, and both are useful. First is the exploration of impermanence in the world of thought, and also in terms of what it brings up in terms of emotions and so on. This may be in the form of high level generalization thoughts such as all is impermanent, and then also explorations within thoughts in more specific ways. I can for instance explore my day or my life, or the life of my parents, or my culture, or human civilization, or the Earth, or the Universe, and specifically see how it all changes over time, including how it all will be gone at some point in the future. This is an exploration of impermanence using thoughts of change, continuity, past and future. To make it a little more real for me, it is helpful to bring it back to my own life. Everything I have experienced in the past is gone and will never come back in the same way. My life is limited. My days are counted, and there is a specific year, day, hour and minute that I will die, although I don’t know what it is. In a hundred year or so, I and everyone I know will be dead. In less than two hundred years, all memories of me will probably be gone, or at least not kept alive much. In some thousand years, most of what is happening in my lifetime will be forgotten. In some hundreds of thousands of years, or maybe millions of years, humans will be gone, and everything humans have done will be gone and there will be nobody to remember it. In some millions of years, this Earth will be burnt to a crisp and all traces of human civilization will be gone (unless we went to another solar system in the meantime.) In some billions of years, this whole universe will either collapse into a big crunch, or disperse enough to die a slow heat death. Then, at the very least, will all traces of humanity be completely gone, and there will be nobody left to remember it either. Also, what happens if I have a vivid, felt-sense of knowing that I will die in ten years? In five years? In a year? In six months? In a month? In a week? Tomorrow? Next hour? Next minute? What comes up for me then? How does it reorganize my priorities? What becomes more important? Less important? How would I live my life then? This way of exploring impermanence can certainly have an effect, especially in terms of my priorities and what seems important in my life. Trying to impress others seems quite a bit less important, because it will all be forgotten and gone in a while anyway. Living a meaningful life, in a way meaningful for me, becomes more important. The other way to explore impermanence is through how it shows up here and now, in immediate perception. Since thought creates a sense of continuity, and also tells us that different experiences are the “same” as previous ones, it is helpful to differentiate the sense fields, to explore sight, sound, sensation, smell/taste and thought distinct from each other. By doing that, it becomes easier to notice how all the sense fields are in constant change. What was here a moment ago is utterly and completely gone, only a thought is left at best, a memory, but this thought is here now, brand fresh and new, even if another thought says it looks a lot like a thought from the past. Everything arising, in each of the sense fields, is fresh and new. A thought may say that it looks similar to a memory of something that was, but that is a story of the past. What it refers to, both as here now and as something happening in the past, is already gone. This form of exploration undermines the whole tendency to take stories as anything more than a thought, arising here now.Â Attachment to stories is weakened, revealing everything arising as awakeness itself. Someone is receiving transplants for just about every organ and body part, in continuous rotation. He even receives a transplant for his head, which makes me slightly uneasy as I realize that there is no fixed identity there. Even the gender changes. It is all OK as he takes a research approach to it, studying the effects of the continuous transplants. The little guy is having every part of him replaced, continuously, including the head and sexual organs. There is no fixed bodily identity possible. I am a little uncomfortable seeing this, but then realize that it is OK since he uses it as a research opportunity, including how it is to live with an absence of (an easily) fixed identity. After waking up and staying with the dream, I realize that this is a very clear representation of my experience of myself… of seeing any identity in flux, always changing… both in terms of the conventional identity itself such as masculine, feminine, physical appearance, smart, not so smart, and so on, and in terms of the identification with any of these identities. It is all in flux. Nothing stays the same. And I see this here now, and also how it changes over a day. I had this dream during our trip to Eastern Oregon, after we had spent our first evening at Crystal Crane Hot Springs in the desert near Burns, and sharing the facilities with a bunch of cowboys and gals on motorcycles. I noticed that there was a continuous shift for me between having an identity as different from them (and experiencing separation) and finding a shared identity with them (no separation), and a slight discomfort in both cases… first, due to the sense of separation, then, due to finding myself as the same as someone I habitually have seen myself as different from. The discomfort in the dream was similar or the same as this one. A sense of having no solid ground to stand on in terms of identity. It fluctuates with the situation, and also in terms of what attention focuses on. First, I see myself as a liberal city-dweller, different from these cowboys and gals in many ways. And then, I see how we are no different… we all enjoy the food, the water in the hot springs, good company, we all have hopes and fears, dreams and nightmares, we all take care of those within our circle of concern, we all do the best we can, we all try to live up to certain ideals and follow certain guidelines in our lives. The essentials, the shared human qualities, are all the same. At most, it is only the superficial strategies that are slightly different, but even here not so much. And in falling into this, and the sense of no separation, there is a slight sense of discomfort, of disorientation, since the old habitual identity has temporarily fallen away or far into the background of attention.